Echinacea purpurea 'Evening Glow'. Another fantastic European import. The stunning bicolored petals are sure to please for many months due to its reblooming habit. While resistant to deer it does attract butterflies and hummingbirds. 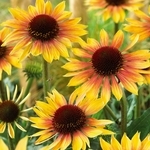 Unlike any other coneflower with its unique bicolored petals and compact size!